As evidence mounts that Hamas intended to murder Israeli children, women and men after breaching the border fence to Israel, Hamas apologists must ask themselves why they are on the wrong side of morality. Yet many in the media, and many Hamas sympathizers on the left, insist on portraying this invasion as a peaceful demonstration, comparable to those conducted against the Ku Klux Klan by Martin Luther King and his fellow civil rights demonstrators. Many in the public seem all too eager to be deceived because Hamas has succeeded in portraying themselves as the civil rights demonstrators protesting against the Israeli Ku Klux Klan. But in reality, the roles are reversed. Hamas is the Ku Klux Klan, violently rioting to break down the protective barrier so they can lynch innocent Jewish children and other civilians, the way the Klan lynched innocent black citizens. In a letter to U.S. Secretary of State Mike Pompeo organized by former (and perhaps future) presidential candidate Bernie Sanders of Vermont, the group demanded that the Trump administration address the “humanitarian crisis” in Gaza. They described the “return” march as a response to the blockade of the strip being conducted by Israel and Egypt. It specifically and repeatedly mentioned the actions of “Israeli snipers” and cited inflated casualty figures produced by Hamas. But at no point did it reference the terrorist group or acknowledge its responsibility for what happens in Gaza, in addition to noting the ongoing international sanctions on an area that even the Europeans know is a terrorist haven with which normal commerce is impossible. Just as outrageous, the 13 Democratic senators—a list that included Elizabeth Warren (Mass. ), Edward Markey (Mass. ), Dianne Feinstein (Calif.), Sheldon Whitehouse (R.I.), Thomas Carper (Del. ), Sherrod Brown (Ohio), Martin Heinrich (N.M.), Tom Udall (N.M.), Chris Van Hollen (Md.) and Jeff Merkley (Ore.)—also demanded that the United States restore funding to the United Nations Relief Works Agency, a body that has not only existed solely to perpetuate rather than solve the Palestinian refugee problem, but which has been infiltrated by and exploited by Hamas as part of its ongoing military campaign. Why did so many Senate Democrats deliberately ignore Hamas’s role in an effort that, as its name indicated, had as its purpose an attempt to wipe out 70 years of history and destroy the Jewish state? Why did they seek to blame only Israel and call to end Gaza’s isolation? Opening the border to Gaza wouldn’t really help Palestinians, who can have no hope for a better life while they are still being ruled by terrorist theocrats who “govern” the strip like tyrants. The only possible outcome of their appeal would be an influx of Iranian weapons and material that would allow Hamas to strengthen its fortifications and its ability to carry on its fight against Israel. The unfortunate answer is that within the Democratic Party, there is now a faction that not only fails to think clearly about terrorism and the reality of Hamas-run Gaza. This group also seeks to appeal to the intersectional left leading the “resistance” to U.S. President Donald Trump, and which falsely claims a connection between the Black Lives Matter movement and the Palestinian war on Israel. Fortunately, not all Democrats agree, and this struggle will play out as America heads towards the 2020 presidential race, in which the party’s left wing will seek to assert its control of the party. If the Democrats are to remain a pro-Israel party, those who care about Israel’s survival must speak out against these senators and others on the left who serve as Hamas’s dupes. As much as Democrats are currently focused on “resisting” Trump, giving Sanders and his friends a pass for a stand that undermines any hope for progress towards peace, as well as undermines U.S. security, will compromise the integrity of their party. Contrary to the assertions of Israel’s left-wing critics, the Sanders’ letter and the left-wing hypocrites who support it show that the coming battle will be not so much for the soul of the Jewish state as it is for that of the Democratic Party. Those who care about Israel can only hope that sane moderates will step up and ensure that Sanders, Warren and their allies don’t prevail. 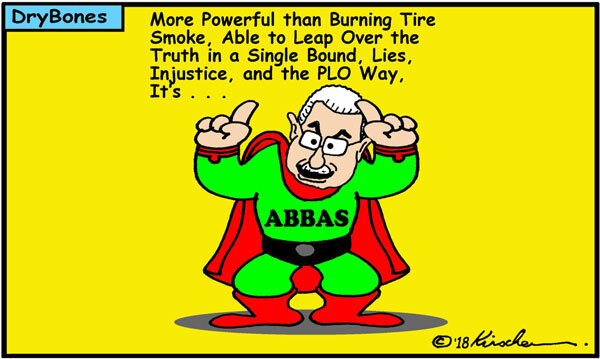 Arch-terrorist Abu Jihad (Khalil Al-Wazir), who organized terror attacks in which 125 Israelis were murdered, has been made into one of the greatest heroes by the Palestinian Authority. One of the PA and Fatah's ways to promote Abu Jihad as a role model to Palestinians is by naming sports tournaments after him. "Martyr Khalil Al-Wazir [Abu Jihad] and Loyalty to the Bethlehem District Prisoners [Futsal] Championship"
At this tournament, in addition to glorifying arch-terrorist Abu Jihad, Fatah also glorified other terrorists and murderers from the Bethlehem district who are serving numerous life sentences for murdering over 100 people. The terrorists' families were invited to a ceremony and given honorary posters with pictures of their imprisoned terrorist relatives. Ali Abu Hleil - Palestinian terrorist involved in two suicide bombings on buses in Jerusalem - one on Gaza Street on Jan. 29, 2004, in which 11 were murdered, and one on Emek Refaim Street on Feb. 22, 2004, in which 8 were murdered. Over 100 people were injured in the two bombings. Abu Hleil is serving 21 life sentences. On Abu Hleil's poster is also written: "Heroic prisoner Ali Abu Hleil - life sentence"
In criticism directed at the former administration, he said the US had gambled that the Joint Comprehensive Plan of Action (JCPOA), or the "Iran deal," would curtail Iran’s rogue activities. Instead, Pompeo showed how Iran’s tentacles have spread across the region, fueled by the deal. In Syria, 11 million Syrians have been displaced by war, at least in part due to Iran’s militias. In Lebanon, Hezbollah is emboldened. In Yemen, Iran is supporting the Houthi militias, he said. In Iraq, the Ayatollahs are also supporting Shi’ite militias. He also claimed Iran was supporting the Taliban in Afghanistan. Pompeo’s list of Iran’s nefarious activities was long. He mentioned US citizens held in Iran and accused Iran of being the world’s “largest sponsor of terror.” This was a speech aimed initially at showing how the JCPOA was a failure and justifying the US decision to withdraw. “It’s 1938 and Iran is Germany,” Prime Minister Benjamin Netanyahu famously warned in 2006. In that vein, US Secretary of State Mike Pompeo’s landmark speech Monday, in which he insisted Iran embark on a “fundamental strategic shift,” was reminiscent of the 1943 Casablanca Conference, where US president Franklin D. Roosevelt declared he demanded nothing less than “unconditional surrender” from the Axis powers. Everyone knows how World War II ended: both Nazi Germany and Imperial Japan surrendered unconditionally about two years later. How the American standoff with Iran will end is still entirely open. Supporters of the US administration’s new hardline position argue that only the stick will get the ayatollah regime to change its evil ways. Others wonder whether there is a Plan B should Tehran reject Washington’s maximalist demands and new sanctions fail to have the desired impact. In Israel, support for Pompeo’s requirements for Iran — including entirely abandoning its nuclear program, ending support for Hezbollah, ceasing the sponsorship of terror and threats of Israel’s destruction, withdrawing all troops from Syria — and his threat of “the strongest sanctions in history,” is a matter of consensus. “We believe this is the right policy. We believe it’s the only policy that could ultimately guarantee the security of the Middle East and peace in our region,” Prime Minister Benjamin Netanyahu said on Monday evening in Jerusalem, mere moments after Pompeo delivered his speech at the The Heritage Foundation in Washington, DC. [Neither] Fatah [nor] Hamas offers Palestinians a practical program for national independence. . . . [The current situation] leaves Palestinians high and dry, with no way forward at all. Whatever the criticism of the “occupation,” Israelis will certainly not abandon the West Bank to chaos or to a possible Hamas takeover. Today the establishment of a sovereign Palestinian state is simply too dangerous to Israel and to Jordan to be contemplated. . . . There are only two other options. The first is the “one-state solution,” meaning union with Israel; but that is a nonstarter that Israel will reject no matter who is its prime minister. The other option is some kind of eventual link to Jordan. In polite diplomatic society, and in Palestinian public discourse, such a link cannot be mentioned. But younger people who visit there, Palestinians have explained to me, can see a society that is half-Palestinian and functions as an independent nation with a working system of law and order. Jordanians travel freely, rarely suffer from terrorism, and [can vote in regular] elections, even if power is ultimately concentrated in the royal palace. The kingdom has close relations with all the Sunni states and the West, and is at peace with Israel. The fundamental question all this raises is what, in 2018, is the nature and objective of Palestinian nationalism. Is the goal sovereignty at all costs, no matter how long it takes and even if it is increasingly divorced from peace, prosperity, and personal freedom? Is “steadfastness” [in refusing to compromise with Israel] the greatest Palestinian virtue now and forever? These questions cannot be debated in either Gaza or the West Bank. But as Israel celebrates 70 years and the “occupation” is now more than a half-century old, how much longer can they be delayed? . . .
Caroline Glick, editor and senior columnist at the Ma’ariv and the Jerusalem Post newspapers, explained on Thursday how the inauguration of the American embassy in Jerusalem created a new reality that has not yet been seen in Israeli-U.S. relations. "All this was not necessary because the Arabs need the Americans much more than the Americans need them. That was true in 1948, in 1967 and remains true to this day, but that's how they operated and it did not lead them anywhere good and it clearly did not help us in any way either,” she continued. Now, said Glick, the facts speak for themselves. "Now that their policy says they accept reality as it is, that is that Jerusalem is the capital of the State of Israel, and this will be the basis of American policy, especially of this administration, it will also affect any future administration that will be unable to build a policy toward us and towards the Arabs which has no basis in reality." Rarely does the photo, four columns wide, of a dead baby appear on page one of The New York Times as it did on May 17. The sorrowful death of Layla Ghandour became, for the Times, “fodder for competing narratives.” But, in fact, a dead Palestinian baby is grist for a newspaper eager to blame Israel first. The accompanying article was written by Times Cairo bureau chief Declan Walsh. He told the poignant story of an eight-month-old Gaza girl with sparkling eyes that he actually never saw. Held “in the arms of her grandmother when a cloud of tear gas engulfed them” at Monday’s Gaza protest, when 50-plus Palestinians were killed as they attempted to breach the border with Israel, Layla supposedly inhaled “acrid gas.” Dying several hours later, her story “shot across the globe, providing an emotive focus for outrage” not directed at the politically zealous family members who brought her there but, predictably, at Israel. Layla’s photo was taken by Gaza photographer Mahmud Hams, who described his specialty as “shots of children crushed in the rubble. Parents weeping beside lifeless little bodies. Death. Destruction. Funerals of men, women, children, sometimes very young children.” It is, by implication, always Israel’s fault. Walsh describes “the pressures of life” in Gaza under “an Israeli blockade” that contributed to Layla’s death. But he inadvertently describes a family’s tragic, zealous dysfunction. Layla was dozing at home when the call sounded from a nearby mosque that a bus awaited passengers heading to the Gaza border fence. Her 12-year-old uncle, assuming that her mother was already on board, took Layla with him. Later that afternoon, when she began to cry, the boy carried her toward the border to find her grandmother, who was busy shouting at Israelis across the fence. Tear gas fell nearby, an hour later Layla died. On May 18, 2018, the UN Human Rights Council (UNHRC) held a “special session of the Human Rights Council on the deteriorating human rights situation in the occupied Palestinian territory, including East Jerusalem.” Many of the non-governmental organizations (NGOs) that participated in the session condemned Israel for allegedly committing “war crimes” and denied the legitimacy of Israel’s right to self-defense. These NGOs accused Israel of committing “crimes against humanity,” “apartheid,” “collective punishment,” acting with “impunity,” and pursuing “colonial” policies, while also calling for sanctions and an arms embargo against Israel. The NGOs similarly urged the international community to push for an independent commission of inquiry to investigate all alleged violations of international humanitarian law and international human rights law, as part of the wider NGO campaign to exploit international legal frameworks as a weapon against Israel. The NGO statements show a consistent pattern of erasing the violent context of the events along the Gaza border, including Molotov cocktails, explosive devises, and arson, as well as attempts to breach the border fence with Israel. These statements similarly ignore the Palestinian use of human shields and the central role of terror organizations, including Hamas, Islamic Jihad, and the Popular Front for the Liberation of Palestine (PFLP) in orchestrating the violent protests. Furthermore, the NGOs ignore that the majority of deaths were of members of terror organizations. These developments closely resemble previous UN inquiries into Israeli military responses to Gaza violence. NGO claims, submissions, and reports are central in the current UNHRC initiative, just as they were in Palestinian appeals to the ICC, the Goldstone Report on the 2009 Gaza war, as well as the UN’s Schabas-Davis commission that reported on the 2014 Gaza war. In these previous cases, Palestinian, Israeli and international organizations- often funded by European governments- shaped the results of the commission of inquiry. Palestinian Authority Foreign Minister Riyad al-Maliki met with International Criminal Court Prosecutor Fatou Bensouda at The Hague on Tuesday and said that further delay to decide on the alleged war crimes issues would allow Israel impunity. Maliki and the PA are accusing Israeli soldiers and officials of war crimes relating to the IDF's killing of over 100 Palestinians on the Gaza border during the crisis there over the last six weeks. The complaint also relates to the 10,000 new units in the West Bank and east Jerusalem that are part of the settlement enterprise and the 2014 Gaza War. While Maliki was said to be giving new information to Bensouda regarding these issues, no major new specifics were shared with the media at a press conference beyond references to what has been publicly reported to date. Israel's Foreign Ministry hit back at the PA, saying it views the push for an ICC war crimes probe "with great severity...and as a cynical process with no legal basis." "The PA continues to exploit the ICC for problematic political purposes in place of acting to advance the diplomatic peace process," a ministry statement said. Further, the foreign ministry said that, "it is preposterous that the Palestinians are doing this when they continue incitement to terror and to use women and children as human shields as camouflage for their violent attempts to harm the security of the citizens of Israel." After the clashes in Gaza that cost the lives of 62 Palestinians Arabs (a Hamas official, Salah Bardawil, said on television that 50 of the victims were members of the terrorist group), a series of diplomatic crises have taken place. While the African National Congress, the ruling party in South Africa, compared Israel to Nazis, Turkey humiliated the expelled Israeli ambassador at the airport. However, another rift between Israel and European public opinion is being defined on Gaza. The Süddeutsche Zeitung, the best-selling newspaper in Germany (one million copies), has published a cartoon with Benjamin Netanyahu dressed as Netta Barzilai and in military boots, a missile in his hand and the star of David instead of the “V” of Eurovision - and a cloud saying “next year in Jerusalem”. After the clamor, the newspaper published the apologies by the director Wolfgang Krach, according to whom the cartoon was a “mistake”. Britain's The Guardian came out the day after the events in Gaza with a cartoon by Steve Bell. You see an Israeli tank who goes fishing, except that in the net instead there are dozens of Palestinian bodies. The Volkskrant, one of the most important Dutch newspapers, has published the cartoon of an Israeli soldier wearing sunglasses and a star of David, shooting against unarmed masses of Palestinians on the border of Gaza to celebrate the 70th anniversary of the independence of the Jewish State. After putting a disarmed Palestinian to the wall, the Israeli shoots a burst to write “Happy Birthday to me”. A couple of weeks before the Gaza riots began, the pro-Israel media watchdog CAMERA put up across from the New York Times building a massive billboard: "The New York Times At it AGAIN: Defaming Israel with distorted ‘news.'" Although its strategic location made it impossible to miss, Israelis nearly universally agree that the Old Gray Lady didn't get the message—and that the Times is but one of a slew of global media outlets copying from the same script, according to which IDF soldiers randomly kill peaceful protesters. In response, an Israeli tank fired on a nearby Hamas observation post, the military said. The suspects fled back into the Gaza Strip after setting fire to the position. With few exceptions, Israel holds the Hamas terrorist group, which rules Gaza, responsible for all violence that emanates from the coastal enclave, regardless of who carries it out. "I hope that OIC member countries implement a boycott decision in line with the recommendation. Consequently, no product should be brought from there any more. Naturally we will assess this situation in the same way," Hurriyet newspaper reported Erdogan as saying. A declaration by the OIC on Friday repeated a call for countries to ban "products of the illegal Israeli settlements from entering their markets," referring to goods produced in the West Bank and Golan Heights. The Turkish Cooperation and Coordination Agency has handed out about $420,000 in $500 checks to east Jerusalem merchants and residents in recent days as a gift for the holy Muslim month of Ramadan, Israel Hayom discovered Monday. The move exacerbates already tense relations between Israel and Turkey, which on Friday called for Israel to be tried at the International Criminal Court for its use of force to deter violent weekly demonstrations along the Gaza border. TIKA is an agency within the Turkish government. In addition to the money, TIKA, which takes pride in its involvement in Jerusalem, also handed out Turkish flags with the name of the organization printed on them. After taking the handout, some east Jerusalem store owners hung the flags at the entrances to their businesses. This comes at a time when Turkey, under the leadership of President Recep Tayyip Erdogan, is waging a campaign to defame Israel at every opportunity. The agency's activities in Jerusalem are part of the "dawah," an Islamic concept that means "calling," specifically to Islam. Activities that fall under the dawah include preaching, proselytizing and other forms of "silent" jihad. After repeatedly insisting that "Israeli soldiers killed 60 protesters" during clashes last Monday, May 14, the New York Times is refusing to clarify whether its count of supposed protesters includes the eight armed Hamas fighters who, according to the Israeli army, opened fire on on Israeli soldiers. A Times article first published on May 15 reports that 60 Gazans were killed during the classes, attributing that number to Palestinian officials. It goes on to say that, according to the Israeli army, "eight of the dead … were armed Hamas militants in civilian clothes who tried to storm the fence in northern Gaza and attacked Israeli forces with grenades and pipe bombs before being killed in a shootout" while another three were killed "while laying an explosive device." So far so good. But if at least 11 of those killed were reportedly armed fighters engaged in hostilities, why do subsequent New York Times pieces claim that "60 protesters" were killed that day? When CAMERA asked about this apparent misuse of language, the Times insisted that its reporting on the events is accurate. When asked to clarify whether that means its reporters concluded, contrary to Israel's assertion, that none of the 60 killed were in fact shooting at Israelis or planting explosives, or if not whether it means the newspaper feels comfortable describing armed militants among the 60 dead as "protesters," editors declined to comment. Nick Ferrari is the commentator beloved by Britain's 'official Jews' because they claim he is a 'friend of Israel'. Anybody following this blog will know how nonsensical this claim is (see links below). Now, several days after the 'baby killed by Israel gas' blood libel was completely debunked he is still pushing the same narrative (and stretching it to to include the nonsense 'seven other children killed'). The fact that this is a clumsy attempt at 'even handedness' - suggesting that the parents should not have taken the children to such a demonstration - does not excuse the fact that he is still promoting the 'Israel kills babies in Gaza' narrative. Of all the 'official Jews', including, for example, those who invited Ferrari to host the recent Israel 70th celebration event at the Savoy Hotel, is there not one able to inform him of the fact that at least 54 of those 62 claimed to have been killed at the border were members of terrorist organisations and that this includes two who were 16 and 17 (i.e. the 'children killed by Israel')? If Ferrari wanted to be even handed why did he not use his column to inform his readers that the terrorist organisations themselves are the ones who have stated that it was their members who were killed. This would have been extremely helpful given that the main stream media has been careful to keep these claims quiet as it contradicted the lies in their previous reporting. The EU announced Friday it will provide 30 million euros to reconstruct the Kerem Shalom crossing—the main passage of diesel and other fuels into the strip—following it being set ablaze by Palestinians last week. Following weeks of protests and riots along the Gaza border with Israel as part of their “March of Return”, one Hamas spokesman has announced that Gaza has officially run out of things to set fire to, and has declared a state of emergency. I’ve been lugging these crutches around for days, participating in staged incidents that purport to showcase Israeli brutality against innocent Palestinians – I play the role of a wounded youth; thus the accessories – and I have to tell you: I have no idea how people who genuinely need crutches handle the damn things. At first I thought it would be a cinch: you just rest the top part in your armpit and maneuver the crutches with your hands. But it turns out that’s not such an easy thing to accomplish when you’re negotiating unpaved ground as I have. I keep losing my concentration and using my “bad” foot by mistake, and that ruins the entire effect we want to generate for the cameras. On top of that, some nitpicker decided that fake injury or not, it’s a bad idea to put any weight on the armpit, because of pressure on nerves or something, and has been bugging me to adjust the crutches to a shorter setting, and that means learning how to use them all over again. I’d rather concentrate on hobbling in a convincing manner away from the tear gas, burning tires, and general mayhem to participate in creating a picture of Israeli-inflicted misery that can be neatly packaged as atrocities by the BBC, CNN, the Guardian, and the New York Times. 1. He passed a resolution before the Fatah’s Revolutionary Committee that if he were to become incapacitated, his vice-chairman, Mahmoud al-Aloul, would replace him for 60 days as the chairman of the movement until primaries and the election of a new chairman could be organized. 2. He passed a resolution before the Palestinian National Council (PNC) allowing the transfer of the PNC’s authority to the PLO Central Committee, which has 115 members, turning it into the body for making the most important decisions, including the election of a new PA chairman. This way, Mahmoud Abbas has pushed Hamas, which controls the Palestinian Legislative Council (parliament) out of the struggle over the succession, leaving it within the Fatah movement only, which is the backbone of the Palestinian Authority. Security officials at the Israeli consulate in New York have forbidden representatives of the Foreign Ministry and official Israeli emissaries from New York to attend a festive event marking Israel's 70th anniversary, which will take place next week at Times Square, News 2 reported. According to the news report, security officials fear that the presence of the representatives at the event will increase the security risk, and that they could be targets for terrorist attacks or violent protests. The security officer of the Israeli Consulate in New York wrote to diplomats and other Israeli emissaries that "this is a very sensitive incident at a very sensitive time. The security team has no security responsibility for the external event. "We prohibit any participation and any presence of the emissaries and employees at this event, which is a very sensitive event with no adequate security response, and the NYPD, including the highest echelons, stresses that this is a very high risk event," wrote the security officer. The Israeli arms industry is expected to lose $1.3 billion in revenue each year and as many as 22,000 workers could lose their jobs when the latest agreement for military aid from the US kicks in at the end of this year, the Defense Ministry warned at a Knesset Finance Committee meeting on Monday. The Memorandum of Understanding negotiated between Prime Minister Benjamin Netanyahu and then-US president Barack Obama’s administration changed the previous terms of military aid. Until now, up to 26% of the aid, adding up to billions of shekels each year, could be spent inside Israel. In the new deal that will gradually be phased out beginning at the end of the US’s government’s Fiscal Year 2018 (i.e., on October 1, 2018), until all American military aid will have to be spent in the US, resulting in losses for local industry. The estimated loss is NIS 4b. per year in defense purchases, which could lead to the closure of 130 factories, many of which are in the periphery. Gafni expressed concern about the MoU’s “severe ramifications for the delicate fabric of the State of Israel, harming its security. “We won’t let something like this pass,” he added. The latest Rasmussen poll shows that a majority side with President Trump’s decision to recognize Jerusalem as Israel’s capital despite the best efforts of America’s establishment media to depict last week’s opening of the U.S. embassy in Jerusalem as a debacle. Moreover, the trend lines in the poll clearly show that Trump won the national debate on this issue against a vast media and establishment propaganda campaign to portray it as an amateurish mistake that would explode the Arab world. Late last year, when Trump announced the move, only 40 percent of those polled supported the president’s decision, while a near-equal number of 36 percent were opposed. Basically, the country was evenly split. Today, however, that division has evaporated. While a majority of 51 percent support the move, only 29 percent disagree. Panama has no plans to relocate its embassy from Tel Aviv to Jerusalem even though it holds that west Jerusalem is part of Israel, its President Juan Carlos Varela told The Jerusalem Post. “Panama is keeping the embassy in Tel Aviv,” said Varela, whose three-day trip to Israel from Wednesday to Friday was sandwiched between the more high profile ones from the leaders of Guatemala and Paraguay, who both opened Jerusalem embassies in the last week. Varela’s country is known as a friend of Israel and is one of only four Latin American nations that have not recognized Palestine as a state. It was one of the 37 nations that supported Israel’s admission to the UN in 1949. It has, however, no intention of making history twice by following in Guatemala and Paraguay’s footsteps with regard to a Jerusalem embassy. Panama's president said on Monday a 1994 plane explosion in the country that killed 21 people, most of them Jewish, was the result of a terrorist attack and called for the case to be reopened. The 1994 crash came soon after a bomb at a Jewish community center in Buenos Aires killed 85 people, raising concerns that Jews worldwide could increasingly become the targets of militants amid tense peace talks in the Middle East. Varela told reporters he will ask Panamanian and Israeli authorities to reinvestigate the incident. A court in Kosovo jailed eight men on Friday for plotting to attack the Israeli national soccer team in Albania in a World Cup qualifying match in 2016. Israeli Air Force commander Amikam Norkin revealed on Tuesday that the F-35 fighter jet conducted airstrikes on at least two occasions, which he said made Israel the first country to use the American-made stealth aircraft operationally. “I think that we are the first to attack with an F-35 in the Middle East — I’m not sure about other areas,” Norkin told a conference of air force chiefs visiting Israel from around the world. The Israeli military later went further, saying that this was the first operational use of the fighter jet in the world, not only in the Middle East. “The Israeli Air Force has twice carried out strikes with the F-35, on two different fronts,” Norkin said. The air force chief did not specify when those two attacks took place, but said the F-35 did not carry out strikes during Israel’s massive bombardment of Iranian targets in Syria on May 10. A bipartisan group of US lawmakers has introduced a motion to stop the sale of F-35 fighter jets to Turkey, arguing that Ankara is growing “increasingly hostile and authoritarian by the day” and expressing fears that the country was growing closer to Russia. Turkey, a key US ally in the Middle East, is slated to purchase more than 100 of the ultra-high tech aircraft. “The Turkish regime, led by President Recep Tayyip Erdogan, has grown increasingly authoritarian in recent years, cracking down on dissent and free speech. They have even held American citizens in captivity in order to use them as bargaining chips with the US Government,” Cicilline said in a statement. “There have to be consequences for any regime that commits such horrific human rights abuses and constantly steps out of line with our own interests,” said Cicilline, who serves on the House Foreign Affairs Committee. Israel Air Force Commander Maj.-Gen.Amikam Norkin said Tuesday that Iran launched 32 missiles toward Israel in early May. “Iran launched 32 missiles and we intercepted 4 of them and the rest fell outside Israeli territory,” Norkin said at the IAF senior Air Force Conference in Herzilya on Tuesday. The IDF had said earlier that the Iranian Revolutionary Guard Corp’s Quds Force had launched 20 Fajr-5 and Grad missiles towards Israel’s front defensive line in the Golan Heights. According to Norkin, Syria fired over 100 anti-aircraft missiles at Israeli jets and in response Israel destroyed the anti-aircraft batteries. According to Norkin, Israel has been “managing a campaign against Iranian forces, especially on Israel’s northern border” for the past two years. Israel had been preparing for a direct attack from the Quds force since mid-April in response for a strike allegedly carried out by the Jewish state against an Iranian operated airbase in Syria which killed seven IRGC soldiers. "[PA] Grand Mufti of Jerusalem and the Palestinian Territories and [Palestinian] Supreme Fatwa Council Chairman Muhammad Hussein called to preserve the sanctity of the month of Ramadan (i.e., Muslim month of fasting). In a statement yesterday the grand mufti demanded that the owners of the restaurants and cafés close them during the daytime hours of the month of Ramadan in order to preserve the sanctity of the month. He called on the responsible parties to go after anyone who publicly breaks the fast and put them on trial." Iranian President Hassan Rouhani on Friday urged Muslim countries to revise their economic ties with the United States in response to its relocation of its embassy to Jerusalem. “I call on countries to totally cut their relations with the Zionist regime (Israel) and also to revise their trade and economic ties with America,” Rouhani said in a speech at a summit of Muslim nations in Istanbul, broadcast live on Iranian state TV.